I made this soup in May when it actually seemed like soup weather, however the weather had transformed into summer the very next day. Soup has pretty much been the very last thing on my mind. And the glorious sunny, hot weather that the Pacific Northwest has been having just seemed to go on and on. But then yesterday the rains came back and this morning I woke up to another grey day. I don’t want to face a new weather trend here, but I’m posting this soup recipe because it just seems like the perfect thing to hit the spot. The window reflects October but the calendar says July. Oh well, I need this bowl of warm comfort like nobody’s business right now. The sun should come out by the weekend and I can most certainly can turn some of the fabulous local broccoli and leeks and potatoes that I bought on the weekend into this bright green and oh so tasty soup. In a large pot, heat oil over medium-high heat and saute the leeks until soft and fragrant. Add in broccoli and potatoes and stir fry it a bit. Add in enough vegetable stock so that the vegetables are just covered. Cover and simmer over med-low heat for 20 minutes or until vegetables are tender. Puree with immersion blender and add in cream/milk and cheese. Taste and add salt & pepper, if needed. The rain had the exact same effect on me! Haha. I just posted a soup recipe. Yum – perfect for this weather, too. Will have to make it before the sun comes back (hopefully, on Thursday!). I love broccoli soup and I love that you added cheddar mmm. I'm enjoying the rainy fall like weather because our apartment was just getting way too hot! Pretty color you achieved there; I bet my boys would eat this! The weather has been a big cooking challenge for me, as well. This recipe looks satisfying without being overly heavy — the perfect solution. I look forward to trying it. Thanks! that looks yummy and, yeah, I could do with some too as, funnily enough, we've also had a fab summer until two days ago when the rains hit us hard here too! This summer in TO has got to be the worst summer in recorded history. It was so cold last night that I was tempted to turn on the thermostat in the house. But I braved it by donning hoodie instead. This soup on the other hand sounds fantastic and the colour is just so fresh and vibrant! A perfect pick me up in the middle of a not-so-great summer! As Bijoux said, the weather over here feels more like fall than summer. It's sunny and crisp today, the perfect September day … too bad its July. This soup looks wonderful, so comforting in its pale greeness. I'd be happy to pull up a stool to a bowl of this, spoon at the ready. We've had maybe a week's worth of sunny days this summer. Rain has been the norm. Your soup looks creamy, flavorful and something to look forward to! I was considering making soup last night, due to the sudden wetness. 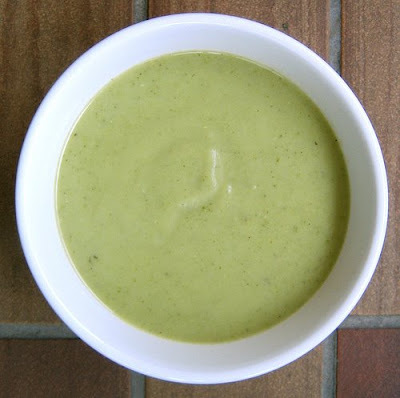 I love creamy broccoli soup, so it looks like that's tonight's menu! Yeah, what is with the weather? I fully made soup on Monday night because of it. Yum! I love potato and leek, broccoli sounds like a great addition. fortunatley, unlike October the rain is not expected to last too long! I was thinking about soup yesterday too. It is great to have "rainy day" supplies in the freezer…and this soup looks perfect. What a great way to use up summer garden broccoli! Thanks for sharing! Many go on about seasonal eating, which is great. But sometimes you just have to deviate if the mood strikes you. Why not hot soup in July? I'll often make a huge pot of chili in the summer and enjoy a big bowl while watching baseball. Love it. What's up with the rain, erin? Soup and summer can indeed mix, sometimes. Rina, looks like there will be a few cool days ahead! eatme, I think it's a bit of a nice break, but I can't wait to get back to sunshine! Aimee, the weather out east sounds so horrible! I hope it gets better when I get there in August! Hmmm, I think central europe and vancouver have very similar weather! Bijoux, that sounds so horrible! This is a nice pick me up, but not enough to bring back summer! Tara, that is so disappointing! But yes, this green is pretty happy-inducing. Amanda Nicole, hope you've been enjoying the soup days while you can! Hag, I agree about having rainy day supplies on hand. Hopefully, it won't last too long at all. I'm happy with sun! Insanewiches, well, it is seasonal since everything did come from a local farm. But I'll take hot soup on a cold July day. It was tasty and hit the spot! Looks & sounds delish. Gonna give it a try over the weekend. Cheers! Thanks Rich, I hope you enjoy it!